Last week Uganda's own David Emong won the silver medal in the 1500-meter race at Rio's Summer Paralympics Games. Now that Emong has returned to Uganda, many are wondering how his win might impact sports and disability advocacy. Ugandan sports fans went wild when, with only 37 seconds left in a four minute race, runner David Emong blasted into second place, earning him a silver medal. 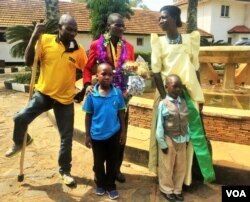 The only athlete representing Uganda in Rio's 2016 Summer Paralympics, his win inspired proud posts on social media from President Yoweri Museveni and sports associations across the country. It is an especially poignant win for Emong, coming from a country where stigmatization of people with disabilities is rampant. Returning from Rio, he was greeted by his family, the Ugandan Paralympic Committee, Sports Council and numerous disabled athletes. Covered in garlands upon his arrival, Emong said the reaction from Ugandan sports officials was wonderful. Emong started running in primary school after his arm was permanently injured and largely immobilized in a schoolyard accident. Although he was sometimes mocked, he never gave up on life. Rather Emong kept going, competing, and often winning, against able-bodied athletes. He hopes his win inspires more kids with disabilities to join athletics. “I am the model of disability; I really expect more people to come into the organization and inject some money. I say to my people, to my fellow athletes to go and qualify and we bring more medals,” Emong said. Uganda Paralympic team member Innocent Tumwesigye has high hopes funding will increase in the wake of Emong's win. "I hope this has started a new chapter for Uganda disability sports, because this is what we have been waiting to see. Because, remember, we had also the general secretary of national council of sports with us. And he said in his words he is going to support also disability sports as he has been doing to the general sports. Because he sees there is a lot of potential. So I am sure we expect a lot,” Tumwesigye said. Emong said he looks forward to competing at the 2018 Commonwealth Games, adding that his work is not done until he brings Uganda the gold.